Inspired by the award winning board game from North Star Games, Evolution: The Video Game has arrived! Create animals that adapt and thrive in a beautiful and ever-changing ecosystem, enhanced by incredible art and thoughtful, balanced mechanics. 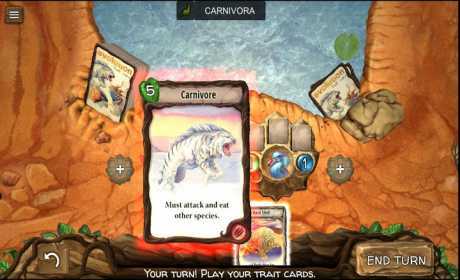 Evolution is a strategy card game where you adapt your creatures to survive and stay one step ahead of opponents. Unlike deck builder games or trading card games, Evolution allows for an incredible diversity of strategy elements with a 17-card deck that is easy to learn but difficult to master. Inspired by science, this game is clever and addictive! -Watering hole running dry? Evolve a long necked dinosaur to reach food in the trees. -Staring down a Carnivore? Develop a hard shelled creature to fend off an attack. -Evolve up the food chain to become a the most successful animals in the environment. Will you be a fierce carnivore or a crafty herbivore? The ecosystem is constantly changing, and you’ve got to figure out what your opponents are up to. Our friendly professor will guide you from one watering hole to the next on our easy, helpful tutorial. Hone your skill as you progress all the way through the campaign then jump into multiplayer and gain recognition in the global ranks! 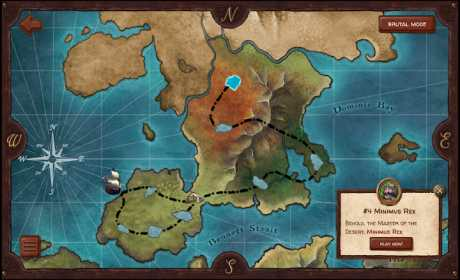 Explore the mysteries of Evolution Island in single player campaign mode and discover distinct Boss opponents. Unlock new Apex Species as you move through the campaign; defeat them to add them to your menu of single-player opponents. 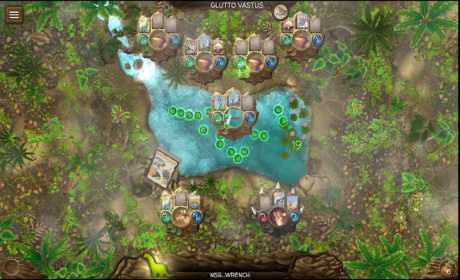 Evolution will match you with players of similar skill in a fast paced online multiplayer game. Make friends and set up private games, or rank up in the ongoing seasonal tournaments. It’s not about the cards you get; it’s about how you play them. The full set of cards are included in the base game, you don’t need to buy anything else. Thousands of possible species combinations evolve from 17 unique trait cards, meaning no two games are ever the same. With a smooth user interface and fast, informative animations, Evolution was built for intense strategic battles. One game and you’ll find yourself addicted. Evolution isn’t just a top tier strategy game – it’s a whole new animal.